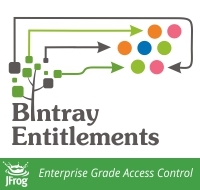 Entitlements are privileges you can give anyone…yes anyone, not only Bintray users, to entities in your private repositories. “Entities” means anything that can contain files – a whole repository, a path within the repository, a specific package or a specific version. “Privileges” means “rw” – download, upload and delete, or “r” – download only. If you didn’t notice, the combination of entities and privileges gives you any level of granularity that you need for providing access. Create entitlements. When you create entitlements, you specify which keys to apply to them.